Google Goggles has finally arrived for the iPhone, with the latest version of Google Mobile for the handset bringing the image recognition software to Apple's iOS 4. Already available on Android, Googles can be used to take a photo of a building and then (usually) identify where and what it is. This is obviously a major perk in finding which direction you are facing, or why that gaggle of Japanese tourists are frantically filling their memory cards with snaps of that concrete building. "It works well for things such as landmarks, logos and the covers of books, DVDs and games. However, it doesn't yet work for some things you might want to try like animals, plants or food. 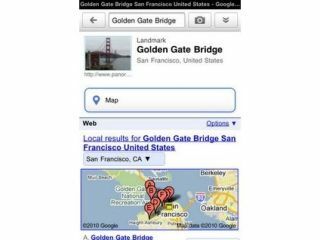 "Google Mobile App with Google Goggles is now available in the Apple App Store. Just search for "Google Mobile App" and download the latest version - it's free. It will gradually be appearing in all App Stores around the world starting from today." The feature is only supported on iPhone 3GS and iPhone 4 handsets running iOS 4 or above.